The Peninsula Parks and Play Spaces Project is an initiative to increase awareness and use of parks and play spaces as local resources that can help foster the healthy development of young children (0-6 years) and their families. 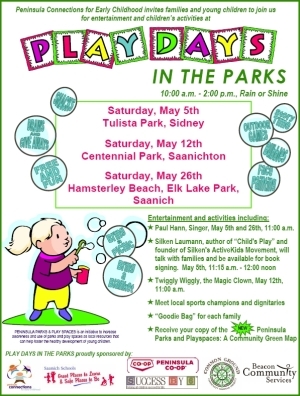 The project has two phases—community involvement processes that will result in development of an informational map of the parks and play spaces on the Saanich Peninsula and “Play Days in the Parks” scheduled for spring 2007. 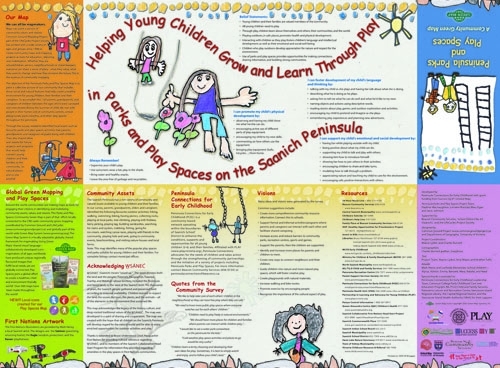 The Peninsula Parks and Play Spaces map will serve as a tool to increase awareness of community supports for children, their parents, grandparents and caregivers. The Peninsula Play Spaces Project recognizes a collective responsibility for the health and well-being of all young children. 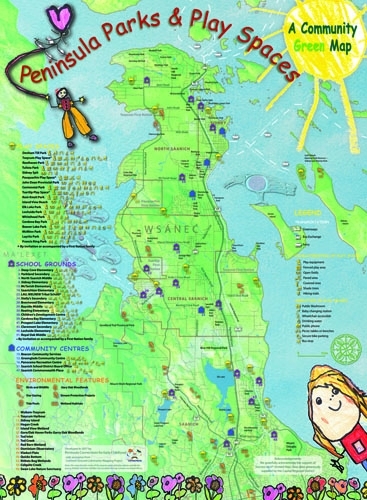 The Peninsula Connections for Early Childhood is a community-based network formed in 2005 in affiliation with P.L.A.Y. (Greater Victoria Partnership in Learning and Advocacy for Young Children.). The Peninsula Parks and Play Spaces Project is an initiative funded by a grant from Success by 6® (United Way) and is supported by Beacon Community Services, Saanich School District, CommonGround and LifeCycles Project Society. The project team reflects further community support from Camosun College Early Childhood Care and Education Program, the Vancouver Island Preschool Association, NIL/TU,O Child and Family Services, Tsartlip Brighter Futures, Panorama Leisure and Recreation Centre, Vancouver Island Regional Library, Vancouver Island Health Authority (VIHA), and the Ministry for Children and Families (MCFD). GIS & Cartography by Charles Burnett (MapsWest) and Ken Josephson (UVic Geography).